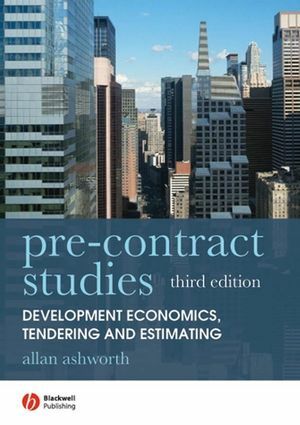 Pre-contract Studies: Development Economics, Tendering and Estimating provides a comprehensive introduction to the property development process, with an emphasis on the financial analysis of projects in the context of development values and construction costs. The book covers capital investment, funding sources, the economics of development, evaluation of financial data, whole life costing and tendering, estimating and cash flow considerations. The process of getting a project from inception to completion is examined in detail, while the different methods of development appraisal, and the way developers' budgets are calculated, are explored with worked examples. The third edition has been extensively revised to reinforce aspects of valuations and more information has been added on the major property companies and who owns the land in Britain, as well as on conservation, PFI and value management. A large number of charts and graphs are new. The book is used on a wide range of undergraduate programmes in building, surveying and associated disciplines. Allan Ashworth D. Univ (Hon), MSc, MRICS is a Visiting Professor at the University of Salford and the Adjunct Professor in Quantity Surveying at Unitec in New Zealand. He is a former HMI (Her Majesty’s Inspector) in the Department for Education and Employment and is currently the Senior Academic Advisor to the Centre for Education in the Built Environment based at the universities of Cardiff and Salford.